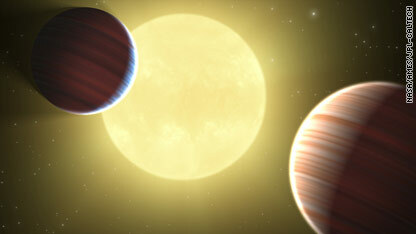 An artist's rendering shows two Saturn-sized planets discovered by NASA’s Kepler mission. NASA has announced the discovery of two planets, slightly smaller than Saturn, orbiting the same star in the Milky Way, which have been discovered by the Kepler Space Telescope. William Borucki, the Kepler Mission Science Principal Investigator, at the NASA Ames Research Center, announced on a teleconference "the first discovery of multiple planets orbiting the same star." The two planets, known as Kepler 9B and 9C, have a clear gravitational interaction, according to NASA. A third celestial body, has also been discovered. It's about 1.5 times the size of Earth, but it has not yet, been confirmed as a planet. "The discovery incorporates seven months of observations of more than 156,000 stars as part of an ongoing search for Earth-sized planets outside our solar system," NASA said in a press release. USE THE SAME MONEY TO BRING PEACE,HORMONY,RESPECT,TO FIGHT SHORTAGE OF FOOD,R&D TO FIGHT DISEASES,EDUCATION,TO FIGHT TERRORISM AND TOLERANCE ON EARTH-THE GIFT OF GOD.MAY GOD FORGIVES US AND BRING PEACE ON EARTH. No, spend more money on securing a better future for all humanity. I think discovering the Americas was a better investment than war and the rest of the budget of the old world. Two unnecessary commas, CNN? Really? I am appalled. NASA can find two planets outside the solar system but they cannot find Planet X which has been INSIDE the solar system since 2003? "The first discovery of multiple planets orbiting the same star." Um... don't all the planets in our solar system orbit the sun? And isn't the sun a star? Or does that quote not mean what I think it means? LOL. I thought the same exact thing when I was reading that! I was so confused! Very exciting and worth the cost! Yes, NASA, we know there are many planets out there but when are you going to stop jerking us around and tell us about the extraterrestrials out there? Some of us have seen their craft at close range, so you cant go on with this charade forever. It is better to be truthful and inform the people of their existence, just in case a ship lands unexpectedly, which could cause a dangerous panic if folks are unprepared and ignorant. The people deserve to know the truth and to be prepared for contact beforehand! Reading most of these comments hurt my brain people are so ignorant. Trying to find life on another planet is a waste of tax payers money? Do you have a brain? Humans strive to know if we are the only ones out there and since the first caveman walked the earth he lived to discover and learn. It's natural instant to explore, now tell me how is that a waste of money?